How do national contexts influence the construction of religious identity in faith communities? In this paper, I examine the construction of Buddhist identities in two similar ethnic Chinese Mahayana Buddhist temples but in distinct national contexts, one in mainland China and the other in the United States. While both are Chinese Mahayana Buddhist temples, they have distinctive temple-level cultures: a strict culture in China and a permissive culture in the United States. Individual-level cultural frameworks also differ. In mainland China, the Buddhists learn their religion dutifully while their US counterparts critically explore religion inside and outside their temples. Relying on theories in cultural sociology, I argue that national contexts influence both individual-level cultural frameworks and temple-level group styles to produce different religious identities. This paper has implications for future studies that examine how community-based religious identities vary according to national context. Di, Di. 2016.“Boundary Formation and Cultural Construction: How do Chinese and Indian Immigrant Converts Understand Religious Identity?” Journal of Religion and Society 18. Published online here. Most scholars study immigrants’ religious lives in a vacuum, paying little attention to the religious lives of people who switch from one religious tradition to another. This article relies on interviews with Chinese and Indian immigrant converts in the U.S. to provide a unique comparative perspective on the religious lives of Asian immigrant converts, with a specific focus on their identity construction processes. Findings indicate that Chinese and Indian immigrants establish different types of boundaries, but form similar cultural content within their identities. I debunk the assumption in existing theories that religious conversion is an either/or transition. Di, Di, and Elaine Howard Ecklund. 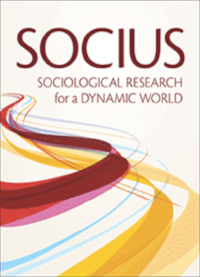 Forthcoming.“Creating Sacredness and Defending Secularity: Faith in the Workplace of Taiwanese Scientists.” Socius. Although a recent body of scholarship focuses on how business professionals infuse spiritual practices in their workplaces, comparatively little attention has been paid to faith in the scientific workplace, especially in an Eastern, non-Christian context. Between 2014 and 2015, we conducted a survey of 892 scientists in Taiwan and completed interviews with 52 of our survey respondents. In this paper, we examine how scientists navigate religion in the scientific workplace. Survey results demonstrate that, while scientists perceive religion and scientific research as generally separate in the abstract, they regard the boundary between religion and their workplace as somewhat permeable. Interviews further show how different groups of Taiwanese scientists create sacredness and defend secularity in scientific work. Results have implications for future research on how scientists (and potentially those in other types of professions) in non-Western and non-Christian countries navigate faith at work. Johnson, David, Elaine Howard Ecklund, Di Di, and Kirstin Matthews. 2017. “Responding to Richard: Celebrity and (Mis)representation of Science.” Public Understanding of Science. Published online here. 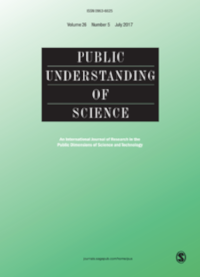 Drawing on 48 in-depth interviews conducted with biologists and physicists at universities in the United Kingdom, this study examines scientists’ perceptions of the role celebrity scientists play in socially contentious public debates. We examine Richard Dawkins’ involvement in public debates related to the relationship between science and religion as a case to analyze scientists’ perceptions of the role celebrity scientists play in the public sphere and the implications of celebrity science for the practice of science communication. Findings show that Dawkins’ proponents view the celebrity scientist as a provocateur who asserts the cultural authority of science in the public sphere. Critics, who include both religious and nonreligious scientists, argue that Dawkins misrepresents science and scientists and reject his approach to public engagement. Scientists emphasize promotion of science over the scientist, diplomacy over derision, and dialogue over ideological extremism. Lewis, Steven W., Di Di, and Elaine Howard Ecklund.2017 “The Double-Edged Sword: Guanxi and Science Ethics in Academic Physics in the People’s Republic of China.” Journal of Contemporary China. Published online here. As China continues to open up to the transnational circulation of labor, ideas, technology and capital under globalization, we must wonder: will Chinese society’s more cosmopolitan and transnational groups continue to be guided by guanxi? The authors conducted 40 in-depth interviews with Chinese physicists at 11 research universities in three cities in order to examine the role of ethics, including guanxi, in the professional lives of one of China’s most cosmopolitan populations, the elite scientific community. Analysis reveals, counter-intuitively, that Chinese physicists very much think about guanxi in relation to their research grants and scientific collaboration, that the ethical connotation of guanxi is contextual, and that some see it as a double-edged sword. They realize that guanxi can empower the individual scientist and the scientific community even as it weakens them both. Scholars have argued that learning science is linked to a decrease in personal faith among scientists. We do not know much, however, about the so-called secularizing effect of science among scientists outside the US, where such religious processes could operate differently. Because the negotiation between science and religion is more salient when faith is in transition, we examine how scientists in Italy (a predominantly Catholic context) construct religious identity during religious shifts. Drawing from interviews with 81 Italian physicists and biologists, we ask whether scientists have experienced any religious shifts and how they went through these shifts, addressing personal secularization theories by analyzing whether and how scientists reconstruct their religious identities by utilizing science. We uncover four patterns of identity construction: constructing a non-religious identity, forming a spiritual identity, reformulating an existing Catholic identity, and re-achieving a Catholic identity. We show that Italian scientists narratively respond to Catholicism more than science in constructing religious identities during religious shifts. Our findings, thus, problematize the so-called personal secularizing effect of science, providing implications for a more fruitful dialogue between science and religion in Italy and more globally. Despite recent scholarly focus on women's underrepresentation in the sciences, little is known about gender disparity in science outside the US and Europe. Since much growth in global science is occurring outside these geographic areas, especially in East Asia, this omission represents a significant gap in the literature. Here we rely on 40 in-depth interviews with both male and female physicists−a discipline of science where there is extensive gender segregation−conducted among physicists in Chinese universities. We ask how Chinese physicists explain why there are few women in physics. Analysis reveals that Chinese social and cultural contexts are reflected in physicists' interpretations of gender segregation. Specifically, the cultural and economic transition in China provides physicists with two competing national gender narratives: gender equality and women's subordination. Both national gender narratives exert influence on Chinese physicists' explanations for gender disparity in physics. Findings further indicate that male and female physicists in China share similar gender beliefs, and their beliefs further translate to discriminatory behaviors towards female physicists throughout their career trajectory. This study asserts a new scholarly discussion about women's underrepresentation in science within China and has implications for gender segregation in elite occupations more broadly. Findings also provide implications for public policies to reduce gender stratification in Chinese science. Ecklund, Elaine Howard, and Di Di. “A Gendered Approach to Science Ethics for US and UK Physicists.” Science and Engineering Ethics 23(1):183-201. Some research indicates that women professionals—when compared to men—may be more ethical in the workplace. Existing literature that discusses gender and ethics is confined to the for-profit business sector and primarily to a US context. In particular, there is little attention paid to gender and ethics in science professions in a global context. This represents a significant gap, as science is a rapidly growing and global professional sector, as well as one with ethically ambiguous areas. Adopting an international comparative perspective, this paper relies on 121 semi-structured interviews with US and UK academic physicists to examine how physicists perceive the impact of gender on science ethics. Findings indicate that some US and UK physicists believe that female scientists handle ethical issues within science in a feminine way whereas their male colleagues approach ethics in a masculine way. Some of these physicists further claim that these different approaches to science ethics lead to male and female scientists’ different levels of competitiveness in academic physics. In both the US and the UK, there are “gender-blind” physicists, who do not think gender is related to professional ethics. 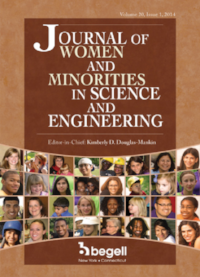 Relying on physicists’ nuanced descriptions this paper contributes to the current understanding of gender and science and engineering ethics.